Samuel Wrayford on Fingle Mill. Since the mid 1800s tourists have flocked to the picturesque area of the famous Fingle Bridge and Fingle Mill on various charabanc excursions where they would wander and picnic. Today visitors still visit the area and some will venture forth amongst the ivy clad ruins of the old mill. Until recently these ancient crumbling walls concealed a history dating back at least to the 1600s but as will be seen later this long forgotten past is coming back to life. It is known that in 1639 there were two mills located below Fingle Bridge, one was a corn mill and the other a fulling mill. When the Rev. Swete passed by in 1797 he obviously was none to impressed with the mill as apart from mentioning a potato garden in a nearby meadow he had very little to say. By the mid 1700s both mills were in use as fulling mills a fact proven by an early insurance document of 1782 belonging to the then tenant John Caldick Davy. In a survey of around 1790 the two mills were recorded as Fingle Mill and East Fingle, by this time Fingle Mill had been converted back to a grist mill whilst East Fingle remained a fulling mill. During this period Fingle Mill was tenanted by George Ponsford who then sublet it to the Brely family. This heralded a long relationship between the mill and the Brelys which ended in 1890 with the death of Henry Charles Brely. – Bodman, 2015. Mills on the Teign, pp. 53-54. Shortly after 1889 the Lamber Gorwyn family left the mill which in effect meant the Berly family’s lengthy connection with the place came to an end. The next occupier of the mill was William Parr and his wife who continued to provide refreshments for the visitors. The last waterwheels in use at the mill were manufactured by Dicker, millwrights from Chagford. Bodman inform us that the waterwheels were capable of powering a pair of fulling stocks or a single pair of millstones. 2015, Mills on the Teign, p.54. As can be seen above one of the water wheel’s hubs is still insitu today. Unfortunately the Parr’s occupation of the mill was short lived as a in the July of 1894 a fire broke out in the mill. It is said that the young miller and his wife, after rescuing their children from the flames, frantically fought the fire with buckets of water, but sadly to no avail. After the fire it was never rebuilt and so in 1897 the owner of the cottage nearest the bridge was persuaded to carry on the tradition of catering for the masses. On the 20th of February 2018 a team of archaeologists, students from the Prince’s Trust and volunteers began a project to rescue what remains of the mill from the dense vegetation cover and to protect parts of the structure from further damage. To read more of the project please follow these two links – Fingle Mill Revealed and The Changing Faces of Fingle Mill. 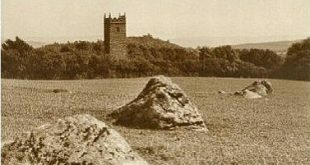 A couple of asides, firstly, you can see a small associated relic of the mill in Drewsteignton church as a single slab of stone from the mill leat now forms the altar in the Lady Chapel – see HERE. Secondly there is a boulder situated in the river which Tom Greeves considers carries the inscription H. C. Berly, however, his wife states that she was told it reads Hurrell? As with many water mills they can sometimes be the scene of tragedy and Fingle Mill is no exception. In 1886 a man from London was drowned whilst bathing in the weir whilst in 1920 the body of a fully clothed 37 year old woman was found in a nearby weir pool who sadly committed suicide.